This setting means that table tags will be retained in the HTML, while without this setting, no layout table will be written. The element Grid can only be added to a page if it does not use the table layout. If you select this option, this page will be transformed to be displayed on mobiles. Well-structured HTML will be used to create the page. If a page contains elements that cannot be transformed for mobiles, these elements will be designated on the workspace with a red crossed-out circle symbol. Dynamic filters (Calendar), if it has an event with the action "synchronizeScaleRange". Dynamic filters (Calendar), if it does not have an event with the action "synchronizeScaleRange". 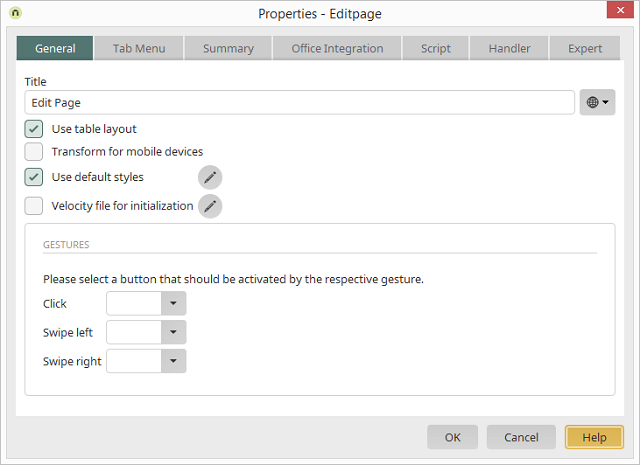 The setting "Transform for mobile devices" cannot be set if the page is used in a plugin. Assigns a default style to new elements when they are created. If this is not desired, such as when user-defined styles should be assigned, this setting can be deactivated. Opens a dialog where margins and style classes within a DIV container can be defined. With this setting, the selected Velocity file will be executed when the page is loaded. Opens a dialog where the Velocity file for the initialization can be selected. can be defined instead of navigating to the next data record.